J. Synth. Org. Chem., Jpn. 2012, 70(11), 1116–1122. Angew. Chem. Int. Ed. 2012, 51(36), 9093-9096. Efficient and selective: Two lipophilic catalysts were used for Baeyer–Villiger (BV) oxidations to give lactones in high yields (see scheme). Cascade reactions involving this BV oxidation were used to selectively obtain either unsaturated carboxylic acids or hydroxylactones in high yields from β-silyl cyclohexanones. Chem. Commun. 2012, 48(76), 9465-9467. In situ generated lanthanum(III) nitrate alkoxide is a highly active and nearly neutral transesterification catalyst, which can promote non-epimerized transesterification of α-substituted chiral carboxylic esters under reflux conditions. Building complexity: α-(N,N-Diisopropylcarbamoyloxy)-β-alkylacroleins and α-(acylamino)crotonaldehydes were synthesized as useful multisubstituted dienophiles. The Diels–Alder reaction of these dienophiles catalyzed by organoammonium salts provides an efficient route to structurally complicated chiral building blocks that contain a quaternary carbon atom substituted with an oxygen- or nitrogen-containing moiety. 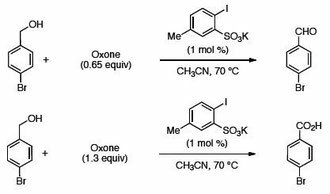 We have developed the first example of hypervalent iodine(V)-catalyzed regioselective oxidation of phenols to o-quinones. 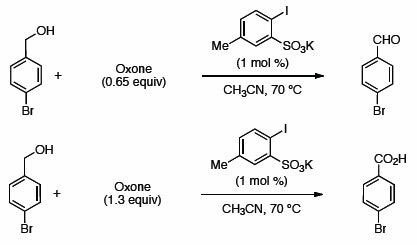 Various phenols could be oxidized to the corresponding o-quinones in good to excellent yields using catalytic amounts of sodium salts of 2-iodobenzenesulfonic acids (pre-IBSes) and stoichiometric amounts of Oxone as a co-oxidant under mild conditions. The reaction rate of IBS-catalyzed oxidation under nonaqueous conditions was further accelerated in the presence of an inorganic base such as potassium carbonate (K2CO3), a phase transfer catalyst such as tetrabutylammonium hydrogen sulfate (nBu4NHSO4), and a dehydrating agent such as anhydrous sodium sulfate (Na2SO4). Org. Lett. 2012, 14(12), 3194-3197. Reverse micelle-type N,N-diarylammonium pyrosulfate (3-5 mol %) efficiently catalyzes the hydrolysis of esters (up to 100 mmol scale) under organic solvent-free conditions. The present method is successfully applied to the hydrolysis of various esters without the decomposition of the base-sensitive moieties and without any loss of optical purity for alpha-heterosubstituted carboxylic acids. Org. Lett. 2012, 14(12), 2972-2975. A catalytic and enantioselective Diels-Alder reaction of alpha-(carbamoylthio)acroleins induced by an organoammonium salt of chiral triamine is described. alpha(Carbamoylthio)acroleins are designed and synthesized as new sulfur-containing dienophiles for the first time. The Diels-Alder reaction affords chiral tertiary thiol precursors with up to 91% ee. Chem. Commun. 2012, 48, 4986-4988. A highly effective catalytic enantioselective direct aminal synthesis was developed. Chiral ammonium 1,1'-binaphthyl-2,2'-disulfonates, which were prepared in situ from (R)-BINSA and achiral amines, promoted the enantioselective addition of primary amides to aromatic aldimines. Chem. Commun. 2012, 48(36), 4273-4283. 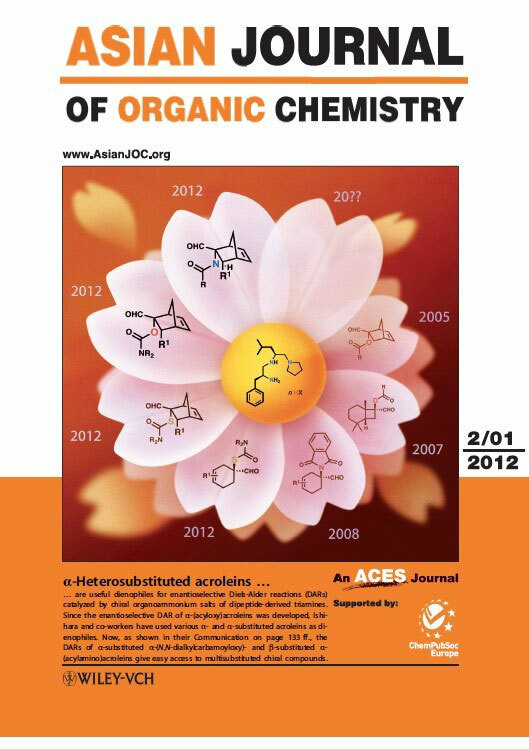 The potential of supramolecular catalysts to realize anomalous regio- and/or stereoselectivity in organic synthesis is highly attractive. To date, there have been a few examples of non-polymeric and non-covalent chiral supramolecular catalysts that induce practical enantioselectivity. In this regard, a metal-organic framework (MOF) may be one of the most important techniques for constructing conformationally rigid supramolecular catalysts. However, it is not easy to use the MOF technique to fine-tune a much more precise cage in catalysts for anomalous purposes. To establish high catalytic activity with anomalous regio- and/or stereoselectivity, in principle, an artificial cage should be conformationally flexible, like an active pocket in an enzyme with an induced-fit function. In this feature article, we focus on the anomalous endo/exo-selective Diels-Alder reaction, and overview the development of the successive catalysts including our recent highly active, conformationally flexible, and chiral supramolecular catalysts. The evolution from ‘ready-made’ single-molecule catalysts to ‘tailor-made’ supramolecular catalysts could offer not only high enantioselectivity but also high anomalous endo/exo-selectivities due to substrate-specific characteristics, as with enzymes. Org. Lett. 2012, 14(1), 30-33. Oil-soluble N,N-diarylammonium pyrosulfates as nonsurfactant-type catalysts for the dehydrative ester condensation under aqueous conditions are described. 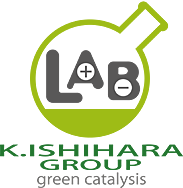 Preheat treatment of dibasic sulfuric acid with bulky N,N-diarylamines generates water-tolerant salts of pyrosulfuric acid as active catalyst species. The present catalysts in water can also widely be applied to unusual selective esterifications and dehydrative glycosylation. Org. Synth. 2012, 89, 105-114. Hyping up the iodines: The discovery and development of oxidative coupling reactions catalyzed by inorganic iodine species (i.e., hypoiodite or iodite), which are generated in-situ from an iodide ion and hydrogen peroxide or tert-butyl hydroperoxide as an environmentally benign oxidant is highlighted.